The large central figure is Buddha Shakyamuni, seated beneath the bodhi tree, suggested by the two large branches with leaves on either side of his head. While seated beneath the bodhi tree, the Buddha becomes enlightened, signified by his gesture of touching the earth with his right hand. At the age of 35, Prince Siddhartha, whose name means “he who achieves his goal,” sat down under a tree in northeastern India and reached enlightenment in a single night of meditation. 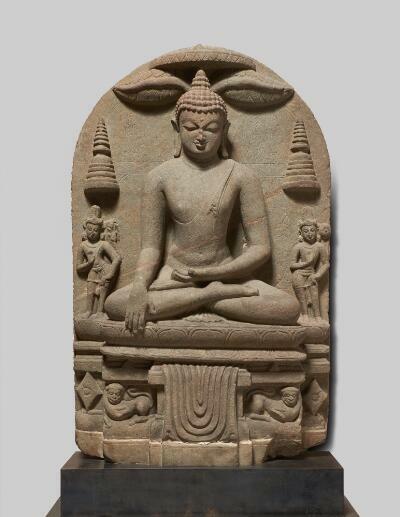 This sculpture depicts him as the Buddha he became that night, seated in the lotus position, the posture of meditation. One of his hands is lowered in the earth-touching gesture, which refers to Siddhartha’s defeat of Mara, the god of death and desire. Mara tried everything in his power to prevent Siddhartha from achieving enlightenment. He sent his three beautiful daughters to tempt the former prince, and armies to disrupt his meditation. But Siddhartha calmly touched the ground with his right hand, calling the earth goddess to witness his right to achieve enlightenment. She signaled her approval by shaking the earth, causing Mara and his armies to disperse. So Siddhartha became a Buddha. Flanking the Buddha are two bodhisattvas, deities who are able to reach enlightenment, but choose to remain active in the world to help others along the path. On the right is Avalokiteshvara, the Bodhisattva of Compassion, and on the left is Maitreya, a bodhisattva who will become the buddha of the Future.